Why did German plane bomb its own submarine crew in Banff? 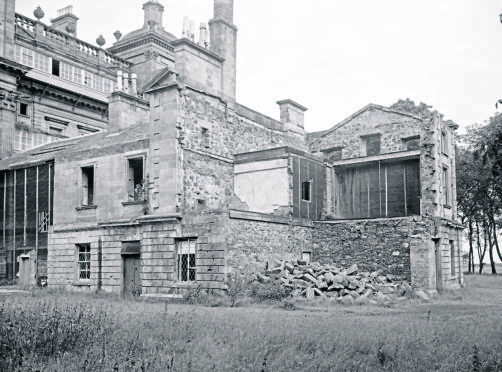 Duff House after being bombed. It’s one of the great unsolved mysteries of the Second World War: why did a German plane bomb its own submarine crew housed in a Georgian mansion in Banff in 1940? The men were incarcerated at Duff House, the elaborate seat of the Earls of Fife, after it was requisitioned as an internment and prisoner of war camp. On July 1, 1940 their U-boat, U-26, had been damaged by depth charges from a Royal Navy corvette in the approaches to the English channel. It was later caught and all 48 on board were taken prisoner. Duff House was designated PoW Camp Number 5, and U-26 crew were brought all the way from the south of Ireland to northeast Scotland, where they were housed in the main building, with guards occupying nearby Nissen huts. However, on the morning of July 22, a Heinkel bomber circled Macduff, a mile and a half away, and dropped four bombs on Duff House. Two of the bombs didn’t explode, but the other brace hit the east wing, a 19th-century addition at the time being used for the PoWs. Six German prisoners from the U-26 and two British guards were killed. Many more were injured. It was the end of Duff House as a PoW camp. The prisoners were moved elsewhere and spent the rest of their war in Canada. The British dead were buried in their home churchyards. The German dead were initially buried in Banff cemetery, and were later re-interred at the German war cemetery at Cannock Chase in Staffordshire. The event is believed to be the only German-on-German “friendly-fire” event in the UK throughout the conflict. And now, Ian Williams from volunteer group The Friends of Duff House is trying to unearth the truth. He said yesterday: “We hope to find out the answers. Why were the prisoners in the main house, and the guards in the Nissen huts? “Why is there no official file on POW Camp No5, but there is on the other early camps? “Why are no troops listed as being stationed in Banff in July 1940? The Friends of Duff House will dedicate a memorial tomorrow to the eight people killed, and to all those injured. The day will include music from Banff Pipe Band, a special exhibition and illustrated talk, and the launch of “Out of The Blue”, a new book with all the details of the known story.